Please find attached camp application form and information sheet. Application forms to be sent to Bethan Jones by 14th May 2019. Camp enrolment/ information evening 21st May, 7pm at Cefn Village Hall. Payment to be made by 1st July 2019. You can pay online: https://www.fndponyclub.org.uk/bookings/events/summer-main-camp-2/. If anyone has issues with payment from 27th April to 11th May, please email support@fndponyclub.org.uk and Fred will attend asap! Equine flu certificates to be up to date. Members need to have attended 3 rallies since 1st Jan 2019. Tom Tulloch is delivering rallies on 18th and 24th April from 4.30pm at New House Farm, SY11 3DS. 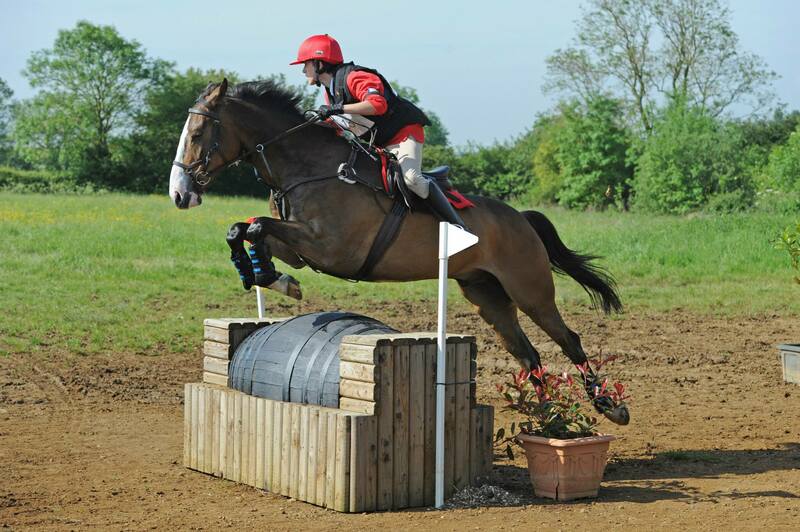 Tom is a Pony Club Step 2 coach and has evented up to Intermediate level. The rallies are based on unique gridwork exercises developed by Shane Rose, Australian dual Olympic Medalist, that aid horses and ponies to jump more effectively and correctly, whilst also allowing riders to adjust and alter their position. The rallies will be group sessions of no more than 4, and £12 per person. Please contact Bethan if you would like to book (dc@fndponyclub.org.uk). 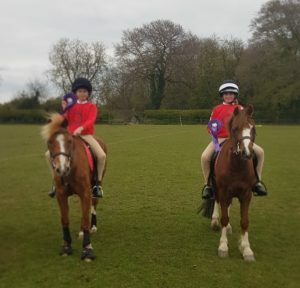 Flint & Denbigh trekked over to the Sir WWW weekend friendly competition on 13th and 14th April, with one senior team, one junior team, and three pairs, each doing two sessions on each day. The senior team of Alex Owen, Cari Jones, Ellie Richardson, Katie Davies and Twm Cernyw had a pretty awful start to the weekend, making quite a few mistakes and picking up a few extra injuries. After three sessions they were in 10th place, so went into the B final. Then their fortunes changed and they had an absolutely fantastic final, picking up 53pts out of a maximum of 56pts and obviously finishing in 1st place! 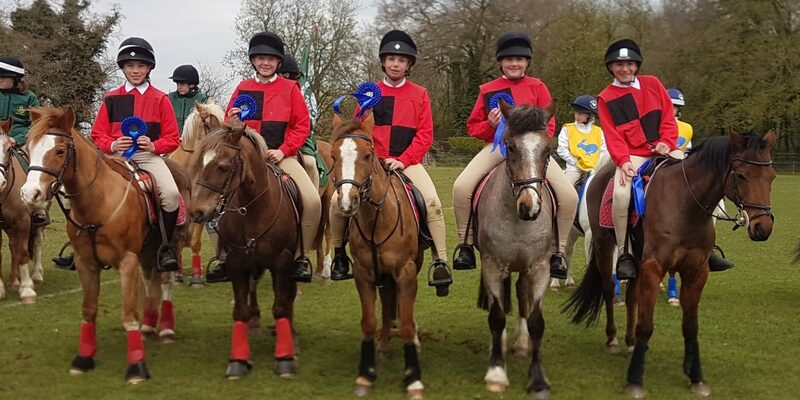 The junior team of Abbie Richardson, Erin Wood, Helen Jones, Lleucu Newton and Llinos Owen were fairly consistent throughout, finishing in 9th place after the three heats. They went into the B final and unfortunately didn’t make up any ground, finishing in 4th place. The pairs competition did not have a final: just 4 sessions and cumulative points overall. Cari Jones and Leia Lloyd Williams finished in 3rd place, Maisie Lester and Katy Jones in 4th, and Rosie Jones and Emma Owen in 6th. 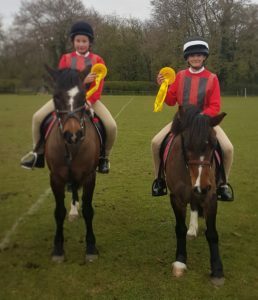 The pairs competition is open to members up to 20 years old, so our Flint & Denbigh competitors who are aged 11 to 14 did really well against older, more experienced riders. Flint & Denbigh also had one rider – Macsen Newton – riding in a junior novice team with Rockwood Harriers. They had some tough competition but finished in 5th place with very little help from parents. Thank you to all the parents that volunteered for the many line stewarding and arena party jobs over the weekend: Flint & Denbigh definitely didn’t cause any delays! 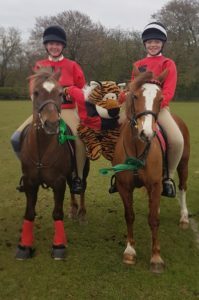 And finally, a special mention and thanks to the senior team who were the only arena party for the junior novice competition on Saturday, putting out and bringing in all the equipment for the different races, at a competition that Flint & Denbigh weren’t even hosting!